Notebooks 6 – our summer edition – is a major update with a whole lot of additions, improvements, changes and corrections. Many of our users’ suggestions found their way into this release, and we want to thank you all for continuously sharing your ideas and requests with us. This is what helps us stay on track. If there is anything in this release that you dislike, chances are high that you find a switch in settings to restore the original behavior. If there is anything you are missing, don’t hesitate to share it with us. The list below contains pretty much everything new in Notebooks 6. All buttons and actions are not correctly labeled and a couple of issues related to Voiceover are fixed. Notebooks is now much better usable with Voiceover turned on. The update for the handbook is delayed due to the number of changes; we’re sorry for that. If you experience any issues, please contact us directly, because this is the most reliably way we can support you. Great updates! Thanks! Just a little disappointed that pdf annotating did not come with this one. It would be nice to do all my work in one app vs. several. Weird, it’s not showing the right font in the desktop app for some of my docs. My default is Trebuchet and that’s not the one that’s being displayed; the iPad app is correct. the documents that don’t show the correct font, are these plain text or formatted documents? Are they all in the same book or spread across different books? These are rich text docs (HTML), not in books, and whenever I update the doc on the app, then it starts showing in the wrong font on the Mac. Ok, I think I know what the reason is: documents at the top level of Notebooks usually use the default font, set in Notebooks’ settings (iOS) or preferences (desktop client). – Could it be that these fonts are not identical? Nope, both default fonts are set to TrebuchetMS. 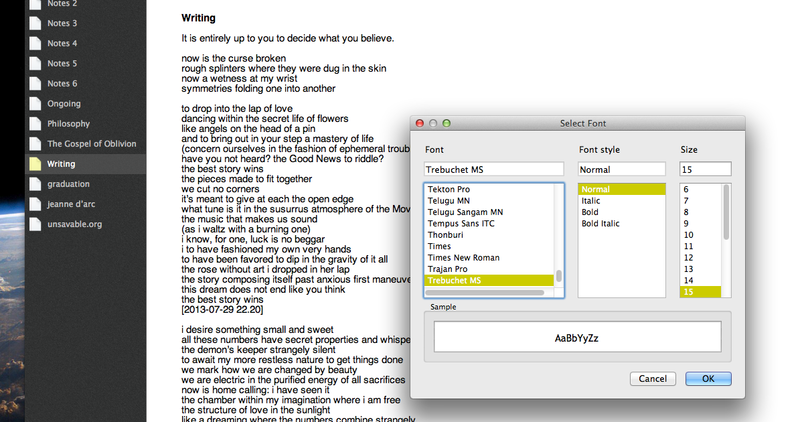 As you see, the document font is set at Trebuchet, but the document is not. The “buy more modules” line in Settings is rather intriguing — any hints or timelines?